A retired high school principal wanted to make a difference to impovrished children on a recent trip to Africa. What she wasn’t prepared for was the impact those kids would have on her, inspiring her to continue her fundraising efforts and set up a non-profit organization. 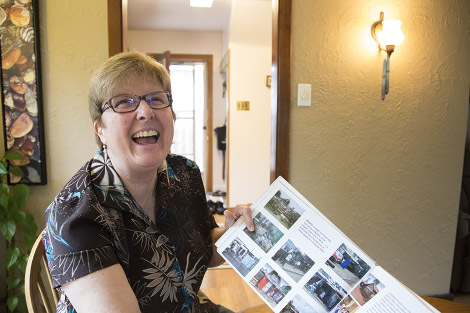 “People say it’s going to be life-changing and yes I realized that but I had no idea the impact the people would have on me since I got back,” said Holly Wickett, who retired about five years ago after working as a principal at Korah Collegiate and Vocational School as well as White Pines Secondary School. She spent three weeks last March participating in what she called “voluntourism," where people pay to travel to another country and do volunteer work while there. At one elementary school in Kenya, Wickett felt a bond with the principal of that institution. “I thought I had lots to deal with when I was doing my job. Her issues were completely different,” said Wickett. The principal of the Compass School was working with no budget and teachers hadn't been paid for months. The first priority of funding the school receives is for food, many of the children are Sudanese refugees, and orphaned due to HIV and civil war and will only eat once a day. Wickett and her group constructed chicken coops and worked on the farm for the school, which will grow fresh vegetables for the approximately 250 children. Wickett has kept in almost daily contact with that principal and is attempting to set up a non-profit organization to continue funding the school. While she waits for the paperwork to be completed for the non-profit organization, Wickett and some others have formed a steering committee to raise funds in the interim. The committee will be hosting a large yard sale at St. Andrews United Church on Saturday between 8 a.m. and noon to raise funds for the school. Wicket said she is forming a new non-profit to ensure 100 percent of funds go to the school. “We’re not part of an organization that needs administration fees paid, it’s all going directly to the principal of the school who buys the supplies they need,” said Wickett. The trip has given her a new perspective on life and she said everyday she thinks about how thankful she is to have been born in Canada. "To have the things that I have. To not be concerned about my next meal. To be able to turn the tap on and be able to drink that water, as much as we complain about it in the Sault,” she said. While on the trip, Wickett read aloud to her group of 12 an article on SooToday about potholes in the city. “We started to laugh uproariously because the roads we had been on in the Congo were like none you’ve ever been on in your life. We had to stop at one point so people could be sick to their stomach, that’s how bad the roads are,” she said. Although she lives in a modest home she says she now feels rich in comparison. “We have poverty in our own country, but there it’s no comparison. It’s everywhere,” she said. Wickett’s group is accepting donated materials for the sale at St. Andrew’s today and Friday from 9 a.m. to 5 p.m. and there will be a cash donation can on-site. “What was really interesting in seeing these people with absolutely nothing, there was still smiles, there was still happiness and hope. I found that absolutely incredible,” said Wickett.